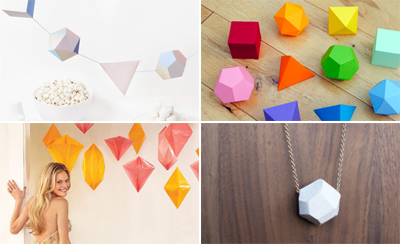 I'm imagining all those pretty shapes hanging all over your home! These remind me of the folded origami stars too. Fun! I've spotted this. I don't know if you have already or not. Brittany, thanks for the polyhedron link! KimOh, I've seen that lamp and I'm delighted. Thank you to you, too, because I would never find out where my fabric goes if it weren't for you guys who send me links. I love those bright colors and the clean shapes! So obsessed with this trend. Thanks for sharing my necklace! these are rad, love the martha ones especially. I haven't seen it, and I love it! Making this could be a bit of fun for me and my little girl. But I would have to go for the coloured ones. White looks a little plain.